Giving a soldering iron to a ten year old to teach them about electronics maybe isn’t the best idea. littleBits, on the other hand, turn basic electronic components into magnetic building blocks that make it easy and safe for kids to build circuits. And now that it includes Bluetooth, those custom creations can finally be controlled by a smartphone. The new littleBits Gizmos & Gadgets Kit, 2nd Edition, is available starting today for $200. It’s an update to the original Gizmos & Gadgets Kit, released about a year ago, that encouraged kids to build fully-functional gadgets and contraptions instead of just simple electronic circuits. The littleBits sets aren’t unlike Lego, which we’ve loved since we were toddlers, but where Lego tends to foster a child’s creative side, littleBits inspire an interest in science and engineering. Kids work towards building gadgets that actually work, using trial and error which helps develop problem solving skills.. The original Gizmos & Gadgets kit included 15 of the littleBits magnetic building blocks, also referred to as ‘bits’, which each boast unique functionality. And while the new version only includes 13, one of those bits adds Bluetooth capabilities, letting a contraption connect to a mobile app on a tablet or smartphone. That introduces an entirely new level of interactivity that kids can incorporate into their creations. 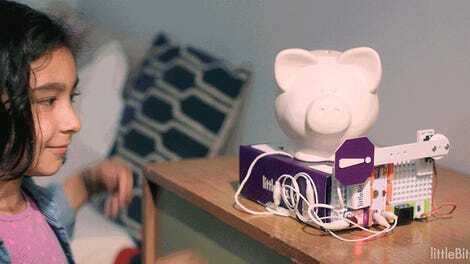 While connected to a smartphone, a littleBits gizmo can then incorporate functionality from the mobile device’s camera, gyroscope, even its touchscreen. A smartphone can be used as a wireless controller to steer a drivable littleBits vehicle around, or its camera can be triggered from a remote shutter that kids can actually build. The Gizmos & Gadgets Kit, 2nd Edition kit also comes with an instruction manual for building 16 different inventions, including everything from a bubble-blowing robot to a pinball-like arcade game. But the accompanying mobile app also lets users share their creations with others in the littleBits community, so once kids have exhausted the list of inventions in the manual, they can still access other ideas and inspirations for new contraptions online. And all the while they’ll think they’re just having fun, when in reality they’re also learning something—suckers!